296 pages | 8 B/W Illus. Hinshelwood, Foreword. Part I: Historical Background and Philosophical Context. Kennard, View of the Evolution of Therapeutic Communities for People Suffering from Psychosis. Kipp, The American Contribution to Therapeutic Community for People with Psychosis and a Reflection on Current Milieu Treatment in the United States. Pedriali, The Decline and Re-launch of the Therapeutic Community. Gale, Exegesis, Truth and Tradition: A Hermeneutic Approach to Psychosis. Kapur, Applying Bion’s Concept of Psychotic Personality to Staff and Patients. Moutsou, When Philosophy Meets Practice: Setting Up a PA Community Household. Black, Psychosis and the Community of the Question: Training Therapists in Therapeutic Community. Part II: Treatment Settings and Clinical Models. Davenport, The Therapeutic Community Approach in Forensic Settings. Vassilev, Groshkova, Jenkov, The Treatment of Substance Use and Mental Health Problems in Bulgaria. Mannu, Soscia, Drug Treatment as a Tool in Therapeutic and Rehabilitative Programmes in Communities for People Suffering From Schizophrenic Disorders. Fergusson, Realpe, Consent, Accountability and the Future of Therapeutic Communities in the Light of Accompanied Self-rehabilitation: The Chemical Asylum and the Right to be Socially Sanctioned. Gomez, Sanchez Espana, An Exploration of the Term Autonomy: Attitudes and Philosophy for a Modern Concept in Mental Health. Schonfield, Navaratnem, Holding Structures in a Crisis Centre: An Applied Psychoanalytical Model. 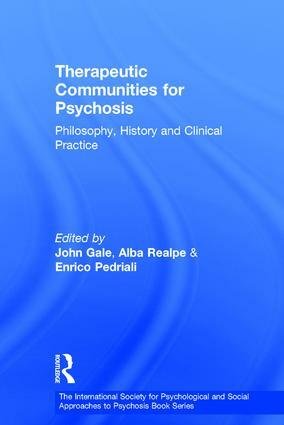 Sassolas, Psychological Care in Therapeutic Communities. Nin Pratt, Madness, Persecution and Transference. Cechnicki, Bielanska, A Community Treatment Programme for People Suffering from Schizophrenia in Krakow. Part III: Alternative Therapies and Extended Applications. Sanchez Espana, Gale, Sanchez Suarez, Surrealism, Psychosis and the Therapeutic Community: A Window Onto the Mental Landscape. Naracci, The Multi-family Structured Therapeutic Community: Reflections on the Experience of the Therapeutic Community Tarsia, Italy. Chaudhry, Niaz, Suleman, The Farm House, Farooqabad, Sheikhupura, Pakistan. Beilanska, Cechnicki, Drama Therapy in a Community Treatment Programme. Psarraki, Psychodrama and the Psychotic Member. Wallenberg Pachaly, New Visions in the Long Term Outpatient Therapy of Psychosis: The Therapeutic Community within the Community. Gale, Sanchez Espana, Evidence for the Effectiveness of Therapeutic Community Treatment of the Psychoses. John Gale is CEO of Community Housing and Therapy, a mental health charity specialising in therapeutic communities. He is a board member of ISPS UK, and was development editor and deputy editor of the journal Therapeutic Communities. Alba Realpe is the deputy manager at Mount Lodge, a therapeutic community in Eastbourne, run by Community Housing and Therapy. Enrico Pedriali is a physician, clinical psychologist, psychoanalytic psychotherapist and consultant in mental health institutions. He is a group analyst and past President of the Italian Association of Therapeutic Communities.